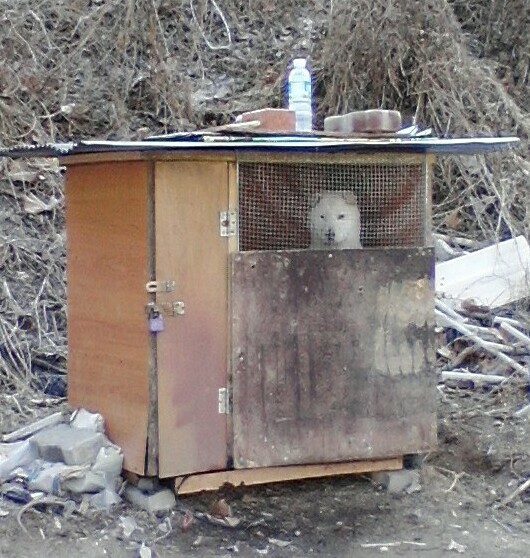 It’s a dog’s life – Hello Korea ! Yesterday it was the last day at CheongPyeong high school for 10 of the teachers, who were moving on to new assignments. That’s a third of the teachers! We picked up 8 more as well. Each one was almost on the verge of tears at the gEditood-bye ceremony. After school there was a big dinner at a Chinese restaurant for them. It was unlike any Chinese food I’d ever had – elsewhere in Korea or in Chinatown in Seattle or anywhere. Maybe it was the real deal, don’t know. Not very appetizing looking, that’s for sure. I was definitely in an msg coma afterward. First time I’d seen teachers tipsy. There was some Chinese spirits on the table – 56% alcohol and 50% alcohol. 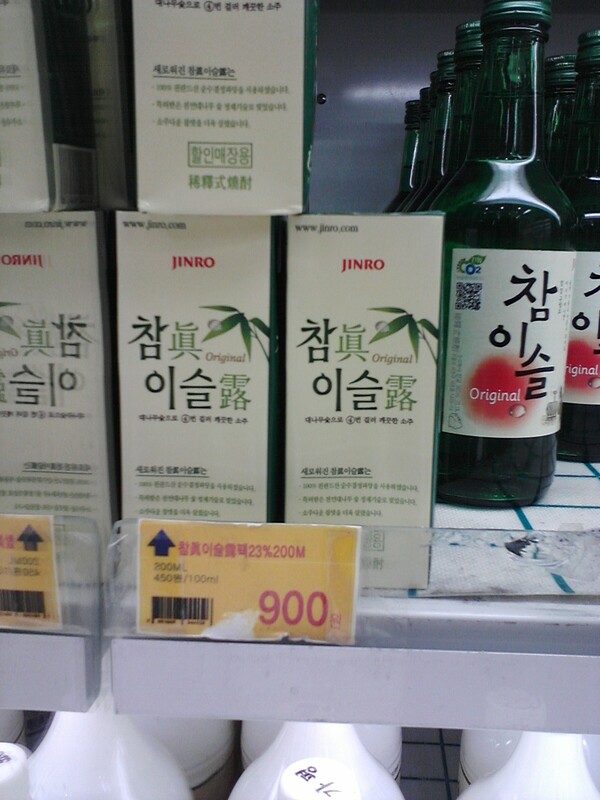 There was also Korean soju at 27%. Most of the teachers were taking the next day off, I guess. The funny thing is that those who can’t drink because they’ve got responsibilities to attend to, or those that just don’t drink, all PRETEND to drink with Fanta or cider. They do the whole ritual pouring and making rounds and toasting, etc. with great flair. It feels strangely like having a miniature tea party like when you’re a child. They were going to continue on to more drinking and I wanted to for once hang out with them, simply because maybe alcohol would cut the communication gap a bit, but I had too much work to do and went home instead. this is for my daughter's boyfriend Mark - these are the soju drink boxes I told you about - they're less than a soda (900 won is about 85 cents U.S.) and available at any convenience store. Today I had to go get my alien registration card renewed in Chuncheon. It was a glorious day outside, like the first day of spring, and I had to check myself not to get too excited, since it’s far too early for warm weather. Decided to take the bus since it’s closer to Immigration, when who should I run into but the world’s friendliest Korean! He insisted on buying me a coffee from the vending machine and gave me his card. I asked where his name was, and he said, “have none.” And then he went back to studying his pamphlets again! I always love the ride into Chuncheon, by any method, though I prefer the bus now that the new Korail line is totally over-crowded, and at twice the price there are plenty of comfy seats on the bus. From that vantage point, one can really almost love it here: the beautiful mountains, the graceful pines, the manicured grave mounds and family markers, the neat farm rows…On those mountains I can picture a small silhouette of myself as a young mother, anachronistically wearing peasant hanbok, baby on my back. traveling >somewhere< with purpose. Unlike Seoul’s Immigration office, there’s nobody waiting in Chuncheon, so it’s pretty pleasant. But it still takes awhile. Like every other alien-related thing I’ve had to do, someone always has to call someone else and talk for a long time, and then you have to go to another office and wait while they decide they have to do exactly what you knew they would have to do. My card was expired and I knew I’d have to pay a 1oo,ooo won fine, why didn’t they? Then it turns out you have to walk to the nearest bank to pay the fine because they don’t take cash or credit. The only reason I can figure for this is because of past bribery. But then the renewal fee of 30,000 won – which in Seoul you have to go purchase revenue stamps – again probably for the same reason – here you pay in cash. (hmmm……) The funny thing is, 130,000 won lighter and all they did was write the new expiration date on the card with a sharpie and cover it with tape! I’ve no idea why he’s locked up like that! I felt like springing him free, but didn’t act on that impulse. It’s the hypocrisy. Left and right and up and down and everywhere. It’s all about image here. Judge and be judged. Even those that hate it let it rule them. Collectivism, like communism is a nice theory – doing your part for the common good – but in practice? Anxiety about not getting your share or not being rewarded for your unequal efforts creates an unholy climate of competition. And then the mechanism for controlling people is built right in, only with collectivism opinion is the whip that bites and keeps people oppressed. It’s genius, this self-regulating oppression. I’m sure those in power love it. You can spend centuries building a great experimental society and you can lose it in just two decades. That’s what happens when the wealthy protect only their own interests. And we let them get away with it. Either side of the ocean, it all goes to hell when every man puts fears for himself above all else. 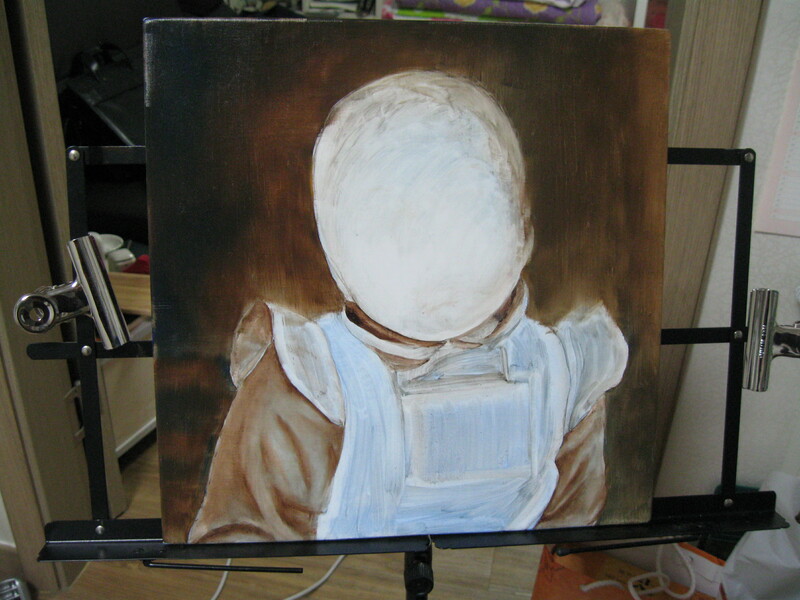 Oils are kind of perfect because I don’t have time to paint all in one sitting, so I can pick away at this. I’ve only done one still life and one abstract in a class in college, and the instructor was really lousy – he only taught us how to prepare the canvas and take care of our tools. I learned more watching youtube for a day last week than I did from him all quarter! So anyway, this is kind of my test case, as I don’t have a feel for it or any techniques. But I’m also not worried. Miwha says I don’t need to go to school, just practice whenever I can. But I think I need the rigor and I want the exposure to what contemporary artists are saying that’s changed the world’s perspectives. So far I’m discovering: to stop thinking of paper and paint as precious, even if it’s expensive as hell – to not scrimp and use as much as you need. to stop thinking you need the best tools and materials – these cheap ones are just fine, (like my music-stand easel?) that a variety of shapes and sizes of brushes really IS nice to have, that it’s a waste of my time to draw anything first (which I didn’t here) since oil can morph and correct itself, to not listen to any rules about how you should do anything (at least those not based in science) and that even if this is just practice, this is really where I want to be.